Independent jewellers since 1858, Watts 1858 has built a reputation for quality and service. 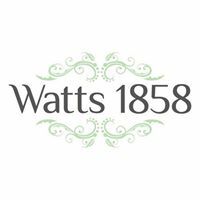 Watts 1858 (Jewellers) Ltd has been a family business since 1858. Our continued success is owed to our long heritage of offering experience and high levels of traditional service to our clients, combined with keeping up to date with current trends and technology. Now based on The Cornmarket in the heart of Derby’s Cathedral Quarter, we offer an extensive range of high quality Swiss watch brands along side a wide range of both branded and non branded gold and diamond Jewellery. Watts 1858 boasts an extensive range of high quality Swiss watches, including Omega, TAG Heuer, Rado, Mont Blanc, Longines, U-boat, TW Steel, Armani, Tissot and Rotary. We also have an extensive range of individually chosen diamond rings and both 18 and 9 carat gold jewellery. Our wedding ring collection includes a wide range of hand made distinctive contemporary designs. Also available are many gift ideas including Thomas Sabo, Blue John Jewellery and the Mont Blanc ranges of pens, leather and jewellery. Watts 1858 is a long standing member of the National Association of Goldsmiths.